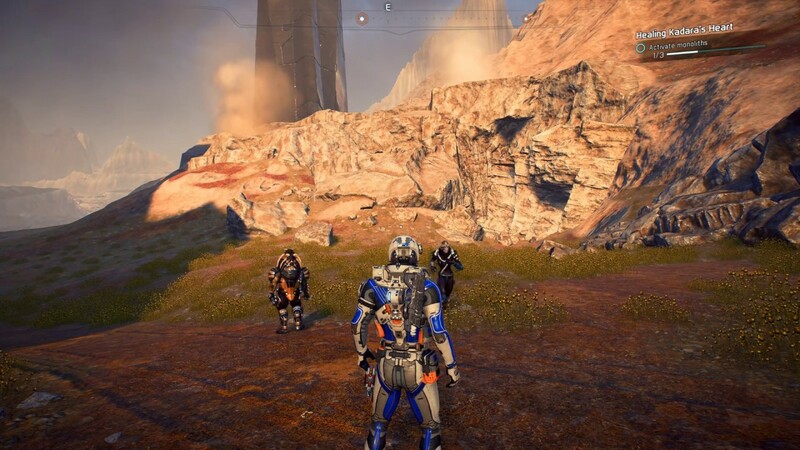 Kadara Map, Kadara Walkthrough, How to Kadara Game Guide for Mass Effect Andromeda. 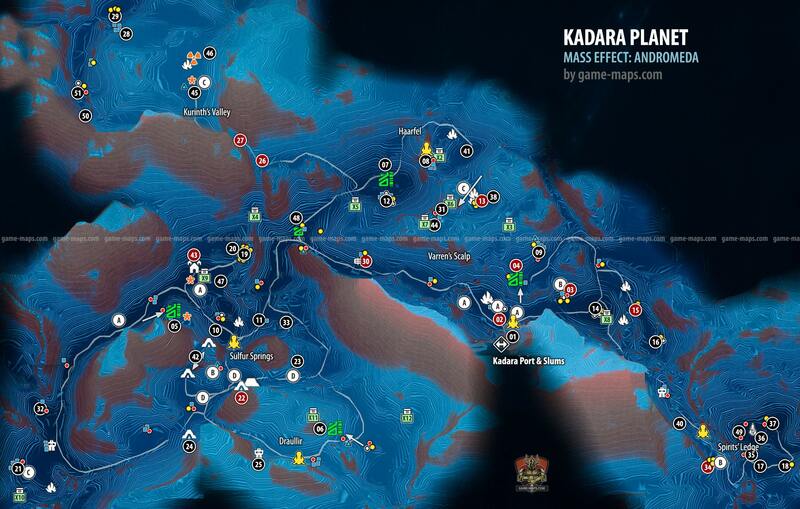 Map contains Quest Starters, Kadara Remnant Vault Walkthrough with Secrets and Rem Tech, Monoliths, Remnant Decryption Puzzles, Forward Stations, POIs locations, Kett Base, Hidden Caches, Caves, Memory Triggers, Remnant Architect, Priority Ops, Secondary Ops, Resources. Of greater concern is the large settlement known as Kadara Port Reportedly once a trade port for the angara, it has been adopted by exiles, pirates, and mercenaries who use it as a staging ground. Kadara Port is considered a rogue state by the Nexus, given its strong ties to the Exiles, and Initiative personnel are advised to keep their distance. Saneris and Drexel have both asked you to scan murder victims in the badlands. One wants justice, the other wants profit. Search for bodies in the cesspools, scan them, and decide who you'll give the information to. Return to Saneris and Drexel with the scan data. You found a datapad revaling that the Collective is holding a member of the Outcast for ransom. Kadara needs clean drinking water-streams and lakes are toxic and filled with sulfuric acid. Remnant technology could transform Kadara's water supply, but the monoliths around the planet must be activated to begin this process. 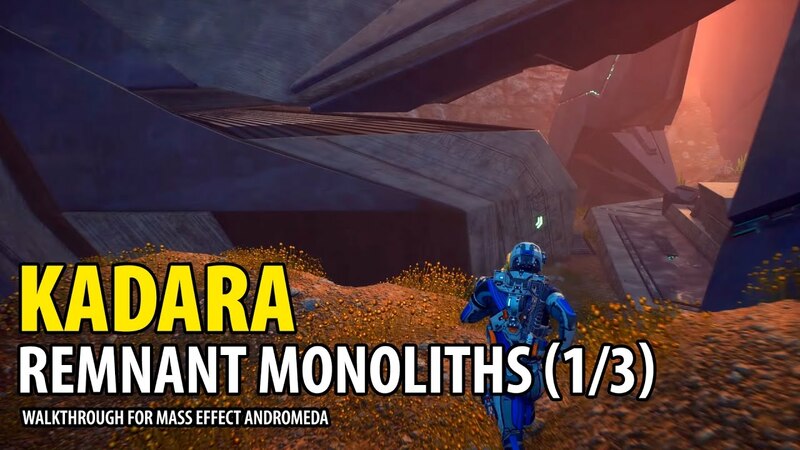 The Outlaw Monolith is a part of Healing Kadara's Heart task. 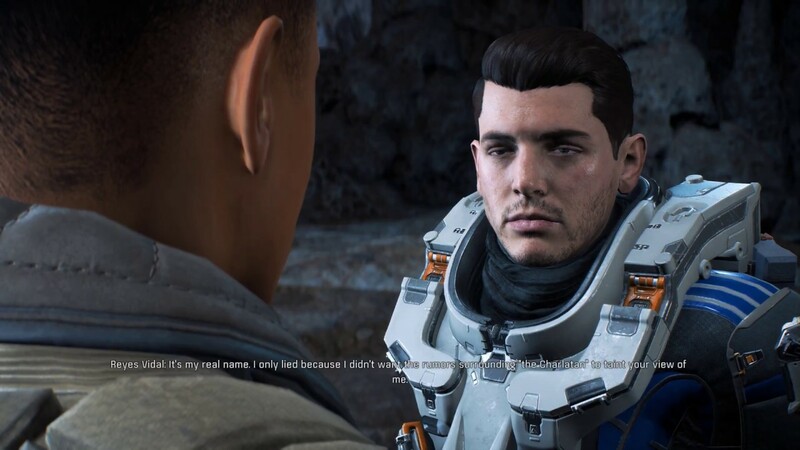 Before an outpost can be established on Kadara, you must Solve Kadara's water toxicity problems and quell the escalating rivalry between the Outcasts and Collective. It is for Safe Journeys, kill them and search containers. For Modern Medicine, kill guards and retrieve forumla. Dr. Farenth tell her you don't belive her and not buying it. Container is at the top of instalation. Next two containers are at bottom level. There is a connection in the tasks between this location Refugee Camp (13) and Herbal Entrepreneurs (29). Incorrect sequence of tasks blocks (probably due to a bug in the game) getting another task. At 13 inside building, talk to Asari and finish Task: Broken Family. At 13 talk to person on right side near the terrarium. Go to 27 and get Emergency S.O.S. An asari on Kadara hasn't spoken to her mother since she was exiled from the Nexus. There's a possibility the signal from her communications equipment could reach the Nexus, but it's broken. You need to look into repairing the equipment for her. Climb the tower, scan and fix. You came across some people living in a hut; they are acting strangely and babbling nonsensically. Investigate the cause of their odd behavior. For A Peaople Divided. You have to scan a lot of items, also small. Traces lead outside, to the blade. It is for Nakmor Drack: Krogan Betrayal. Defeat the exiles. 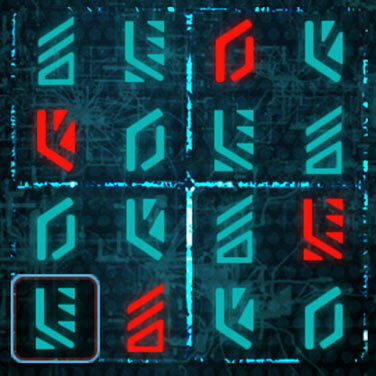 Search the hideout for clues. Surveyor's corpse for The Baryte Rush, above the corpse you will find datapad. Behind closed doors. You will meet Lynx. 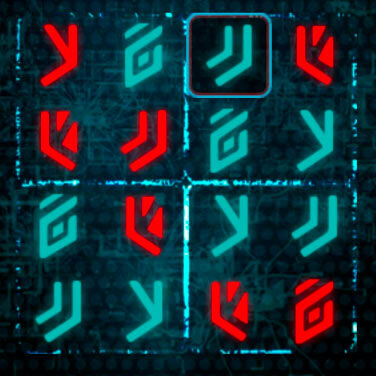 You've learned that the Collective build a hideout deep within one of the cave networks in Draullir. Just go to Crux and talk to her. 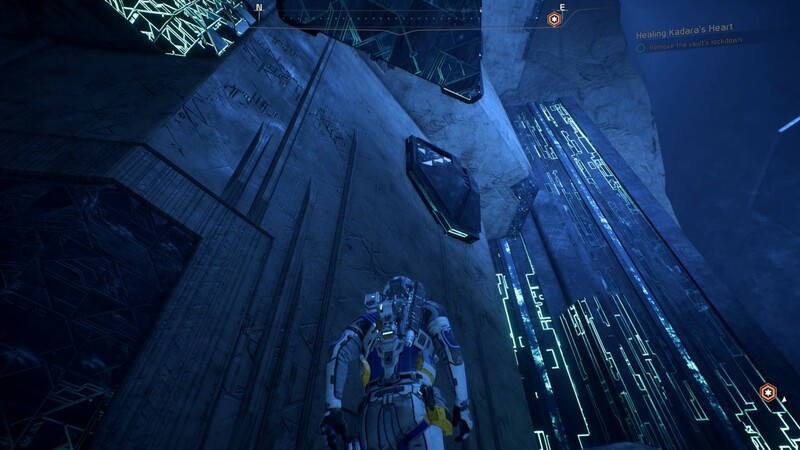 There are some scans inside base. Also you will find containers. One of the Charlatan's representatives has been tweaking orders for their own gain. You have offered to discreetly investigate the Collective base to help uncover the imposter. Crux has provided you with two clues to help identify the imposter their footprint is humanoid in shape and they should have high levels of residual sulfur on their clothes. Mysterious Button at the foundations of the building. Each press will give you another message until the text ends. Some containers around the base. For A people Divided, enter building, defeat the Roekaar. Explore cave for containers before you exit. While exploring Kadara, you found a settlement littered with dead angara. Scan around, listen to audio log and go to Kadara 20 to finish it. Audio Log Quest Item, listen to it. An urgent S.O.S. signal from someone in serious trouble was received. Follow the S.O.S. signal to its source. For Emergency S.O.S., just talk to them. Scavengers are stealing turbine parts from the wind farm outside Kadara Port. An exile named Aislin has enlisted your help to bring the parts back. A turian named Thrasia sold you the navpoint for a weapons cache stolen from the Nexus. Weapons Cache for A Packaged Deal, defeat the exiles, examine. Location for Task: Kadara's Ransom after you scan 3 datapads. Investigate the bodies. Watch for land mines. Scan weapon cache at crash site. Prevent the shuttle from leaving Kadara. Scan cache at Kadara 34, Scan cache at Kadara 35, at Kadara 37 destroy shuttle by shooting explosives and kill outlaw. Final location for Task: Cold Hard Cache. Shoot explosives at ladning zone to prevent the shuttle from leaving Kadara and defeat the outlaws. 38 Salarian near terrarium inside building. It is possible after finishing Emergency S.O.S. Task at (29). You've found a UV light that could help the herbal entrepreneurs grow their plants. Bring the UV light to the herbal entrepreneurs. Return to Kadara 13 and talk to Refuge Doctor. Meeting Point for Precious Cargo defend youself. Now you can finish Settling Kadara, to do this you have to return to the Tempest. 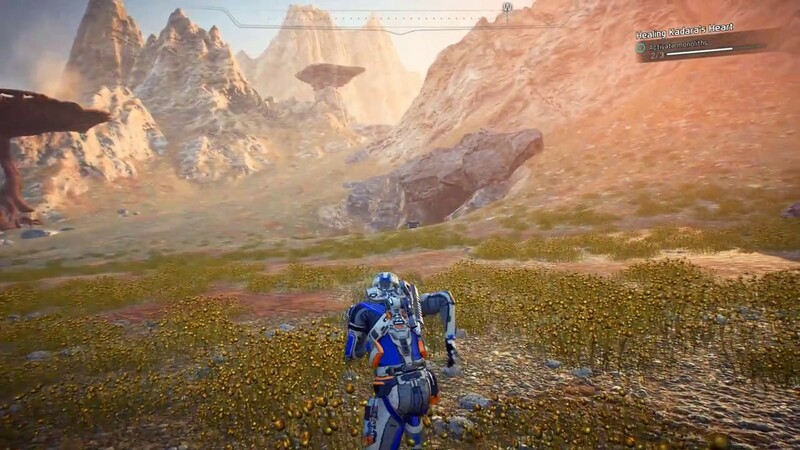 In both cases you will be able to build Outpost on Kadara. A group of settlers have created a cult to worship a massive machine they call Old Skinner. Their leader, Bishop, left to pay tribute in Kurinth's Valley but has not returned. Defeat the outlaws for Peebee: Remnant Scanner and search site for rem-tech piece. Defeat the Three Sabers and search the hideout. Location for Contagion, defeat the Roekaar, and enter building. Start from lower floor, use console. There is no need to kill her. Let the Roeaaker leader go. C Scan minerals for Task Hitting Rocks For Science.